March 19, 2019 by David Shields. Average Reading Time: about 2 minutes. Creative Wood Type & Engraving Co appeared in three New York City Directories 1942–1944. In 1942 and 1943 the company was listed at 71 Park Place, and in 1944 was listed at 71 Park Place and (just around the corner) at 261 Greenwich Street. The address included on the only known specimen printed by the company listed the address at 119 West 23rd Street in Manhattan. The broadside displays the faces is 6-, 8-, and 10-line, and four of the faces — Britanic Script, Airport Display Condensed, Airport Display, and Stencil — were shown in 5-, 6-, and 8-line. The text on the broadside states that any size between 4- and 60-line could be cut. This particular broadside may likely be dated to have been published sometime after 1948, but no later than the early 1960s. The earlier date of 1948, is indicated by one of the faces shown on the broadside. Creative’s cut of Stymie Open appears to match a foundry face named Stymie Bold Open. Mac McGrew, in American Metal Typefaces of the Twentieth Century,1 stated that “ATF literature lists a Stymie Open, but no specimen or other evidence of it has been found. … Stymie Bold Open offered by Baltimore [Type Foundry] is a copy” of the Bauer Foundry’s Benton Bold, and was first shown around 1948. The later date of early-60s is indicated by the format of the telephone number included on the broadside. The number indicated is CHelsea 3-9435. The two-letter five-digit phone number was adopted in the early 1930s in New York City. The city changed its telephone exchange again in the early 1960s to comply with Bell Systems updated North American Numbering Plan that included a seven-digit local number format, thus dropping the use of letters in the phone number. There are some further hints that indicate the company may have been in business until 1953, but are not able to be substantiated as of this posting. Further research will be required to describe with more accuracy the history of the company, but the specimen evidence clearly adds another manufacturer to the list of known American wood type manufacturers. 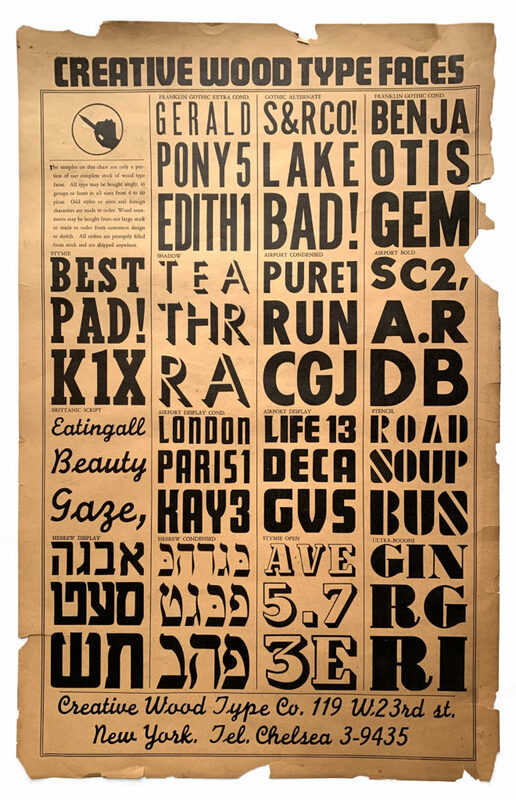 Creative Wood Type Faces broadside appears through the generosity of John Horn, Shooting Star Press.